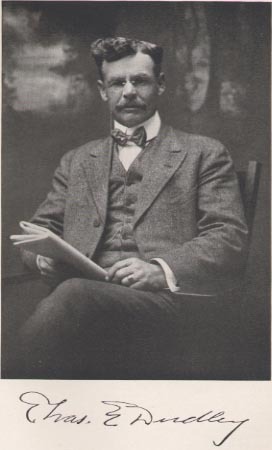 CHARLES E. DUDLEY. One of the well known men who came early to Stevens County, bravely faced the hardships that were the portion of all settlers in the middle '80s and who through industry and wise management met with final success in his undertakings, is Charles E. Dudley, of Moscow, builder and owner of the leading hotel at this place. Mr. Dudley is an extensive grain farmer and has wide reputation because of his success as a finisher of beef cattle. Charles E. Dudley was born in Clinton County, Missouri, and is a son of Judge Edward and Clementine (Langdon) Dudley, the latter of whom died December 19, 1913, at Liberal, Kansas, at the age of seventy years. She was born in Caldwell County, Missouri. October 20, 1843, and was a daughter of Charles Langdon. Judge Dudley was born in New Jersey in 1834, was liberally educated and taught school in young manhood. He learned telegraphy, came to Missouri in 1851 and for twenty years was an operator for the Hannibal & St. Joseph Railroad. When he left that company he went into the grain business at Lathrop, Missouri. During the Civil war he belonged to the railroad brigade while agent for the above road and was called on to act as provost marshal. He has always been active in the councils of the democratic party, was elected mayor while residing at Lathrop and later served one term on the probate bench in Stevens County. He is a prominent citizen of Liberal, Kansas, and has served as mayor of this city and in other public capacities. He is identified fraternally with the Masons and Odd Fellows. Judge Dudley was married at Mirable, Missouri, to Clementine Langdon, and the following children were born to them: Flora, who married Hugh Callahan, died in Bates County, Missouri; Charles E.; William O., who lives at Amsterdam, Missouri; Walter H., whose home is at Johnstown, Missouri; Daniel D. Dudley, born April 1, 1869, who lived near Kansas City, Missouri, died February 13, 1919; Ada, who is the wife of Charles McAnish, of Amorette, Missouri; Bertie, who is the wife of Charles Howard, of San Francisco; Tolman, who is a prominent citizen and public official at Shreveport, Louisiana; and Katie, who is the wife of Frank G. Boles, of Liberal, Kansas. Judge Dudley brought his family from Clinton County, Missouri, to Kansas. At the time Charles E. Dudley located in Stevens County, June 4, 1885, he was about twenty-two years old. He entered a homestead and also a tree claim three miles southwest of Moscow. During a part of the time while proving up he was a clerk in stores conducted by his father at Lakin and later at Hartland and also, as opportunity offered, engaged in freighting, which at that time was an exceedingly important occupation from every point of view. His early crops were practically failures, his first satisfactory one not being realized until 1891. In the third year Mr. Dudley exhausted his entire capital of $42 in the purchase of seven heifer calves, and his methods of handling them proved so successful that he considers that purchase the foundation stone on which his fortune has been built. When these calves were two years old and in fine condition he was able to mortgage them for enough cash to buy a bronco team, of which he had great need and of which he was justly proud. Their colts formed the nucleus of his subsequent fine bunch of horses, and with their use on the farm he was able to so cultivate his land that with favorable climatic conditions, his excellent wheat and rye crops of 1891-2 were brought about. He was thereby able to pay off his mortgage on his calves, now grown to be cows. They were of but common stock but from them he bred to high grade White Face and Shorthorn cattle and ultimately he became a feeder and fattener of matured cattle for the markets. For six years he made this an important feature of his work and no one in this county has ever been so successful along this line. In bringing his cattle to the best market stage Mr. Dudley was a careful feeder, making use of Kaffir, maize and corn with a liberal amount of oil cake. So exceptional was his success that the Rock Island and Santa Fe Railroad Companies made use of a picture of a pen of his stock ready for market, in their advertisement exploiting the sections through which their systems run, and Mr. Dudley frequently afterward heard from interested people from all over the country. He has also been an extensive raiser of hogs. For the past twenty years he has been an important shipper from this section. For the first ten years of residence in Stevens County Mr. Dudley lived in a dugout, as did the most of the other settlers at one time or another, but then put up a story and half frame house, which at that time was one of the best in the county. He occupied that until 1917, when he moved to Moscow. He has 600 acres under cultivation, largely in wheat and rye, and his land has produced twenty-five bushels to the acre. In the old days, when wheat was cheap, a statement that seems almost incredible in the light of modern wheat prices, Mr. Dudley remembers hauling his wheat crop at a distance of thirty-three miles to Liberal, and there could get but forty cents a bushel. Largely because of such conditions he turned his attention to broom corn, which at that time frequently sold for from $18 to $55 a ton. As prices went up for small grain he gradually returned to its culture and as transportation facilities became easy, prices on all commodities of farm and field gradually assumed right proportions and probably will continue so when normal times come once more to the world. When the railroad came to Moscow Mr. Dudley with commendable business enterprise, erected the Dudley Hotel, which is a first class hostelry, and has built three other substantial buildings here. When the loan companies abandoned their lands and permitted their sale for taxes, many shrewd business men saw their opportunity and Mr. Dudley bought quarters, being able at first to secure some for $15, but later they rose so in price that he had to pay $100 and $500 and in 1917 he paid $4,000, acquiring sixteen quarters in all and still owning nine quarters. In politics Mr. Dudley is a republican. He has served as a school director and as township clerk, and in 1916 his party brought him forward as its nominee for representative. At a special election January 17, 1919, he was elected representative from the One Hundred and Twenty-fourth District (Stevens County). In his religious views he is inclined toward the Society of Friends.